A large aquatic park that will please the whole family! Imagine a large, turquoise, heated swimming pool surrounded by a tanning deck, 4 slides, a fast-flowing river and a lagoon…a dreamlike aquatic park! Our 2400m² aquatic area offers a wide open view of the ocean. Your children will love playing on the 4 slides and the younger ones will have fun in the large paddling pool. 300m² of the pool are partially covered with a removable glass cover so you can swim in every season. For total relaxation, sunbathe on one of the deck chairs or on the terrace outside the bar-lounge area that overlooks the pool area. 500 metres from the campsite: the beautiful beach at Contis, a vast strand of fine sand along the ocean. 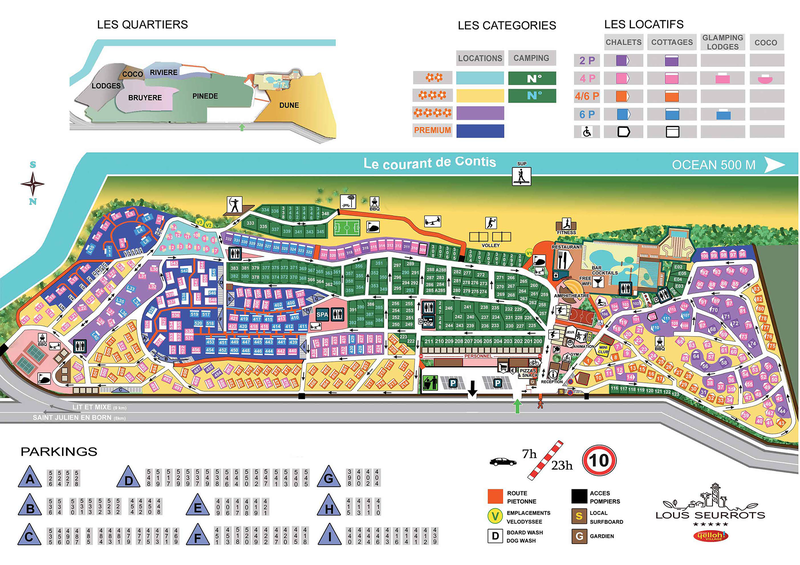 During your stay at the Lous Seurrots camping, take time to discover the famous beaches in south-western France. Enjoy hours of relaxation and swimming on nearly 5 km of beach in Contis. It is a surfers' paradise that is supervised starting mid-June. You will also be amazed by the beauty and immenseness of other legendary beaches located only a few kilometres from the camping: the beaches at Mimizan. Would you prefer a green environment? The lakes in the Landes region, including Biscarosse, have safe swimming areas.